1) Follow the instructions given by Dr. Ellie, NOT the directions on the product labels. 2) Do not rinse with water at any point during the three steps of the System. 3) You may recognize the rinses, but this is a radically new way to use them, with radically new results. 4) Use this system twice or three times a day. Always use before bed – since most tooth damage happens when you are sleeping. 5) Don’t forget your xylitol! 50% of the System is the rinses and toothpaste, the other 50% is xylitol use throughout the day, after meals, snacks and acidic drinks (at least 6-10 grams a day). We wanted to make sure everyone knew the EXACT products to use for effective use of the System…as not all products (even within the same brand) are created equal. Step ONE (2-3 min): Pre-Rinse with Closys™ and brush with Regular Crest® Toothpaste (avoid whitening, tartar, or plaque control products). It is important to brush your teeth in a neutral pH or alkaline mouth. This is the purpose of the Closys. NOTE: Do not add the flavoring to the Closys. Step TWO (30-60 seconds): Rinse with Listerine® to freshen your mouth and as an effective rinse that kills the bacteria that cause gum disease. This rinse contains alcohol and is acidic, but in Step THREE you will be rinsing it off your teeth. (Simple is better – AVOID Listerine® products that have whitening, plaque, or tartar-control formulas. Always look for the ADA Seal on the label. Look for original, cool mint or citrus Listering®. 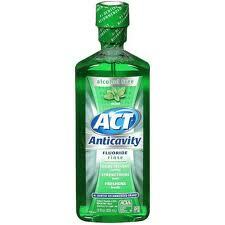 Step THREE (1 min): Rinse with ACT® to protect teeth. This final rinse should remain on your teeth for as long as possible to help remineralize and protect your teeth. The longer it remains on your teeth, the stronger your teeth will become. Choose Original ACT® in mint, cinnamon or bubblegum flavors. Do not use ACT Restore®. Xylitol Throughout the Day! Eat Zellies Xylitol after meals, snacks, acidic drinks or anytime to protect and strengthen teeth throughout the day. Shoot for 6-10 grams per day for maximum results. Xylitol will remove harmful germs from your mouth and help strengthen soft teeth. To see some of the Frequently Asked Questions about the Zellies Complete Mouth Care System, please visit: http://www.zellies.com/faq.html. To purchase your own Zellies Complete Mouth Care Kits and Zellies Xylitol, visit the Zellies Shopping Cart. Is there a reason you specifically suggest not using ACT restore? Shouldn’t enamel strengthening be considered a good thing? Please let me know if you have time! ACT restore has not shown me the clinical results we see with original ACT. The minerals that go into teeth (to repair and rebuild them) are from your saliva, not in the mouthwash. You only need a little fluoride to start this process of moving the minerals from saliva and into your teeth. Fluoride simply works as a kind of gatekeeper in this process. It seems the restore version of ACT is LESS efficient as a gatekeeper. Sadly many “new and improved” products are not better – they just use clever marketing for “better profit margins”. I would love to order your Complete Mouth Care System KIT but cannot locate a place to order it in your store. I have looked for each product for several months & cannot locate all of them. What are your thoughts on the Smart Mouth solution? I’ve never recommended this product and never seen any remarkable patient results from its use – so… I cannot comment. Smart Mouth works in much the same way as Closys. This is why it may help with bad breath and assist with periodontal problems. On the other hand, I recommend my system because it addresses not only gum disease, but recession, cavities and general tooth and mouth health. Would the new Listerine Naturals mouthwash be alright to use with this system? It appears this rinse is different – but not recommended. I wish I could tell you otherwise! It seems sticky and cannot be a part of the system we recommend. We suggest you sick with the two old recipes of Listerine – Cool Mint and Original…. Can you suggest a substitute for ACT? ACT has Sorbitol in it and my “system” can’t handle sorbitol in any form. Thank you. Even when you spit the rinse out? Even very small amounts of Sorbitol cause me a “severe” reaction (even when I spit the rinse out). I’ve learned this the hard way over the years. Unfortunately, a majority of mouthwashes and toothpaste contain Sorbitol. Is it important to swallow the Xylitol? Or is swishing and spitting (or chewing and spitting) OK? The xylitol gum I chew is Icebreakers Ice Cubes. I get them at the grocery store, and they don’t have sorbitol in them either, as this blog warns about. Plus you get 40 cubs for $3.98 at Walmart, and each piece of gum has a whopping 1.15 grams of xylitol, more than almost all other xylitol gums you can get at the store.. Since the dentist who runs this blog says she doesn’t make any money off of promoting Zellies, I thought it would be okay to post an alternative xylitol gum that is more accessible to get, and is cheaper than Zellies. Hi Ann, Thanks for helping spread the word about xylitol. I am glad there are other xylitol companies out there! When I began making xylitol products it was impossible to find xylitol in the US. Also at that time most gum contained titanium dioxide (paint) and soy lecithin – which is not always a good ingredient. Xylitol is an ingredient in about 85% of all candies in Finland and is well known in Asia and Japan. Hershey Ice Cubes probably contain a decent amount of xylitol – I could not verify, but they also contain mannitol and maltitol syrup – which can be very harsh on the stomach. Also many people do not want artificial sweeteners, dyes, or colors.